The nine earthquakes that rattled Dallas over the past 24 hours are reminders to take steps to protect your family, home, and business before an earthquake hits. FLASH offers the following easy and affordable earthquake safety tips for residents. 1. Support ceiling fans and light pendants with bracing wire secured to a screw eye embedded at least an inch into the ceiling joist. Secure hanging artwork and heavy furniture with these easy and affordable steps. 2. Anchor the tops of bookcases, file cabinets and entertainment centers to one or more studs with flexible fasteners or metal “L” brackets and screws to prevent tipping. 3. Secure loose shelving by screwing into the cabinet or with earthquake putty placed at each corner bracket. 4. Secure china, collectibles, trophies, and other shelf items with earthquake putty. 5. Install a lip or blocking device to prevent books or other articles from falling off shelves. 6. Secure televisions, computers, and stereos with buckles and safety straps that also allow easy removal and relocation. 7. Install latches on cabinet doors to prevent them from opening and spilling out their contents. 8. Hang mirrors, pictures and plants using closed hooks to prevent items from falling. 9. Cover windows with approved shatter-resistant safety film to protect against broken glass. Prevent post-earthquake fires with these easy and affordable steps. 10. Ensure appliances have flexible gas or electrical connectors. 11. Strap the top and bottom of a water heater using heavy-gauge metal strapping secured to wall studs. 12. Locate your gas shutoff valve and ensure you know how to turn off the gas supply to your home with the use of a suitable wrench. 13. Relocate flammable liquids to a garage or outside storage location. For additional resources for businesses visit the FLASH and FEMA QuakeSmart initiative. For more how-to earthquake information, residents can visit the Protect Your Home in a FLASH video library. Missouri’s the “Show Me” state, and last winter it did just that to St. Louis homeowner Flora Dimitriou, who learned at 1:30 a.m. on a frigid January night what happens when water pipes freeze. Awakened by a loud bang, Dimitriou knew a pipe had burst in an upstairs bathroom and rushed downstairs to shut off the water line. At first, there was no water to be seen. 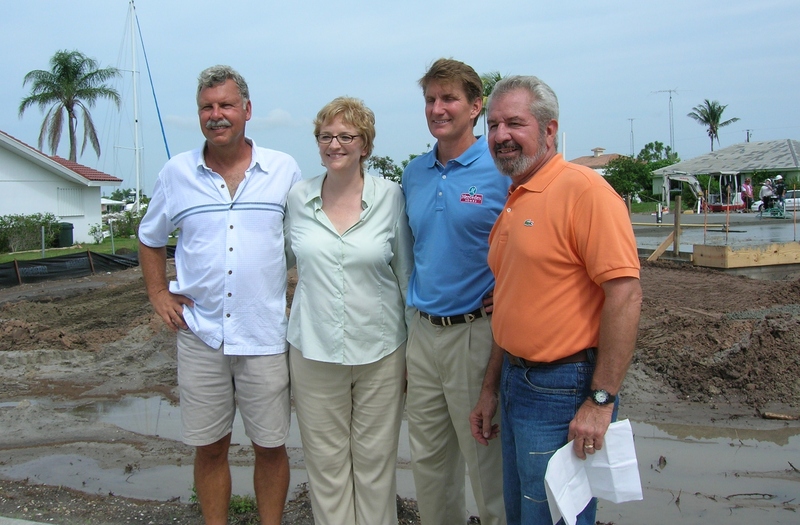 The fractured pipe was in an exterior wall of a bathroom – the only one of her 3.5 baths to have an outside wall. But as the water in the pipe thawed, the water came – leaking what amounted to four buckets of water onto the ceiling of the den, directly below the bathroom. Dimitriou moved aside furniture and punched eight holes in the den ceiling to relieve the water pressure. Buckets under each hole caught the dripping. Hours later, the leaks finally stopped. Repairs included a teardown and replacement of at least half of the den ceiling, and cutting out and replacing the damaged portion of the bathroom pipe, which required removal and replacement of wall tile, and insulating the pipe. The cost: $1950. “We had two options: Leave it alone and insulate what was there or actually re-do the way the plumbing was installed, which would mean tearing down the whole ceiling in the den and turning the shower around so the pipes would be coming in from an inside wall,” she says. She says there’s actually one good thing about the experience: The leak started in the bathroom’s linen closet. If the burst pipe had been under the two sinks, the cabinets would have had to be replaced. Ironically, Dimitriou did the things you’re supposed to do to protect water pipes from freezing: They were insulated, dome covers shielded outside spigots from snow and ice and water lines were drained or allowed to drip to prevent freezing. But in her family’s 12 years in the house, the side with the corner bathroom had always been cold – even after the builder re-insulated it, she says. “The next house I buy, I’d want to know more about the plumbing and make sure there was adequate insulation,” she says. Meanwhile, Dimitriou expects to start using a small space heater near that bathroom a little sooner than usual this year. Learn more about “foam, dome, and drip” precautions to protect pipes and other winter weather tips for your home at FLASH’s Great Winter Weather Party. 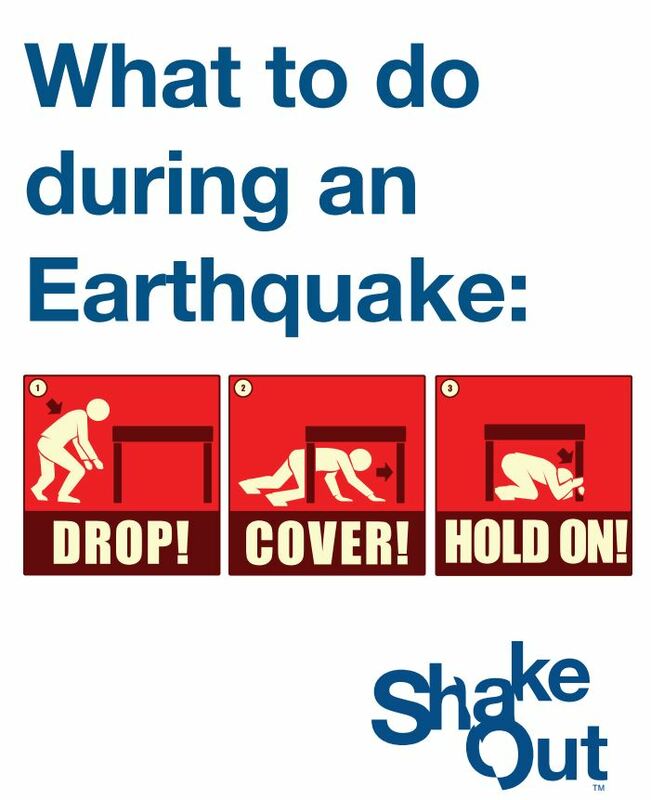 Visit ShakeOut.org today to join millions of people in thousands of businesses, schools, and organizations registered worldwide to practice “Drop, Cover, and Hold On” on October 16. ShakeOut is a fast and fun drill that will help you, your family, and your coworkers get prepared to survive and recover quickly from the next big earthquake, no matter where it strikes. Registration is free, and the drill will only take a few minutes. The website has resources for planning, getting prepared for earthquakes, encouraging others to participate, and more.